The third and final link in keeping big bait alive is gas. Specifically the two gasses we want to look at are Oxygen and CO2. How many times have you measured the Dissolved Oxygen level of your tuna tubes? How about the CO2 levels? Never? Don’t feel bad, few have. These invisible gasses play a huge role in keeping big baits alive. The first part of this discussion centers around dissolved oxygen. Dissolved oxygen is one of the key indicators of water quality. Just as humans need oxygen to breathe fish need sufficient amounts of dissolved oxygen to survive. When confronted with this people often say, just add oxygen and everything will be allright. Not exactly true in this scenario. How much dissolved oxygen water can carry is determined by the temperature of that water. Bottom line, warm water can carry less dissolved oxygen than cold water. 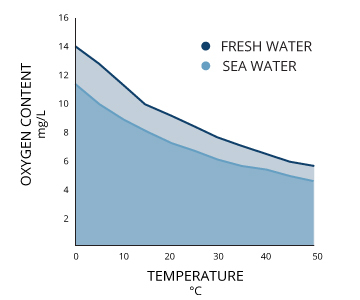 In addition, saltwater cannot carry as much dissolved oxygen as freshwater. The chart below visualizes this. As water temp increases dissolved oxygen carrying capacity decreases. So if our water temp is no good, we can pump all the oxygen we want into the tank but it will never be right. You could actually over saturate which can lead to neurological issues in the fish, basically making them high on oxygen. We never want to exceed more than 120% saturation. I mean, nobody wants a neurotic bait right? So, we know temp is important right? So if we take the 83.5° surface water and cool it to 70° it automatically fixes our dissolved oxygen level right? Not quite. Though we cooled the water and increased it’s dissolved oxygen carrying capacity we did not actually increase the dissolved oxygen level in the water. That can be accomplished a couple of ways. The simplest, most economical solution is gas exchange. Think of the goldfish tank you had when you were a kid, you had the little bubbling treasure chest that bubbled and opened and looked all cool? Well that was not just for show, each bubble that rose to the surface, created a surface disruption and exchanged some gas with the air above the tank. It let some oxygen in, and some CO2 out. So, simply adding a bubbler or airstone to your tank can increase Dissolved Oxygen levels. But… remember above we said we never wanted to go over 120%? Well the bubbler method will only get us to 100% MAX and that is even a lofty goal. Actual measurements show we can get to 80-90% saturation using this method. Which for most anglers is fine. But if you want to REALLY take your bait to the next level you need to be pushing that 120% mark. Obtaining dissolved oxygen levels of 100%-120% is actually easier than you may think. 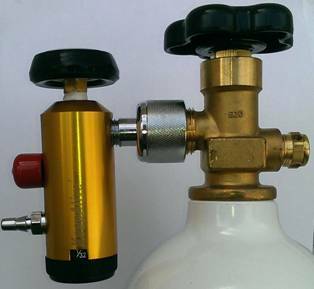 The system involves a small oxygen tank, a regulator and some hose leading to a diffuser stone or ceramic element. The pure oxygen is injected as super fine micro-bubbles into the water where they float to the top and exchange gas with the outside world. Ironically a lot of ‘small bait’ anglers already use oxygen injection systems to be able to overcrowd their bait tanks with obscene numbers of baitfish, keeping them live, frisky and perfectly healthy. Just as with humans fish expire CO2 when they breathe. This parameter often gets overlooked, oxygen is what keeps them alive right? But just as if you left a car running with a garage door closed, the high level of CO2 is going to kill you no matter how much oxygen is in the room. Traditional tuna tube setups rarely suffer from the CO2 issue b/c fresh water is pumped in at high rates, the CO2 never has a chance to build. But on partially or fully recirculating systems it can become an issue. Good for us, the solution is VERY easy. A simple water disturbance at the top of the tank will allow CO2 to off-gas properly, keeping the levels well below lethal. Problems can arise when on closed systems lids are kept closed and gas cannot be exchanged with outside air. Some ground breaking tournament boats today are opting for an option to valve their system to fully recirculating so that bait can be brought into the marina or inland waterways and kept alive for tomorrow mornings bite or tournament. In these installs we have to make sure there is enough water disturbance near the surface, open to the air, that allows CO2 off-gassing. Although often overlooked or disregarded Dissolved Oxygen and CO2 play major roles in the success or failure of keeping bait alive. Ever had days where all your bait just died? Maybe the surface water did not contain high enough levels of Dissolved Oxygen?